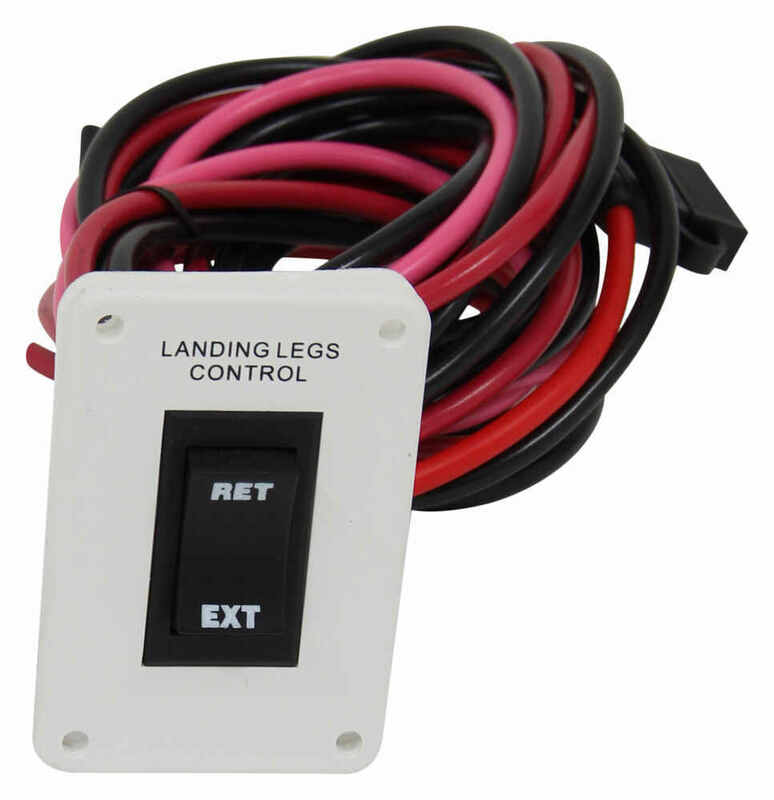 Electric, fifth-wheel landing gear set's motor has an IP-rated switch for fast, easy, and safe operation. Each leg is 33-1/2" tall, offers 19-7/8" of travel, and has a 15" drop leg for extra lift. Combined weight capacity is 6.5K. 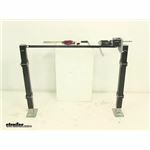 Call 800-298-8924 to order Stromberg Carlson camper jack part number LG-4 or order online at etrailer.com. Free expert support on all Stromberg Carlson products. 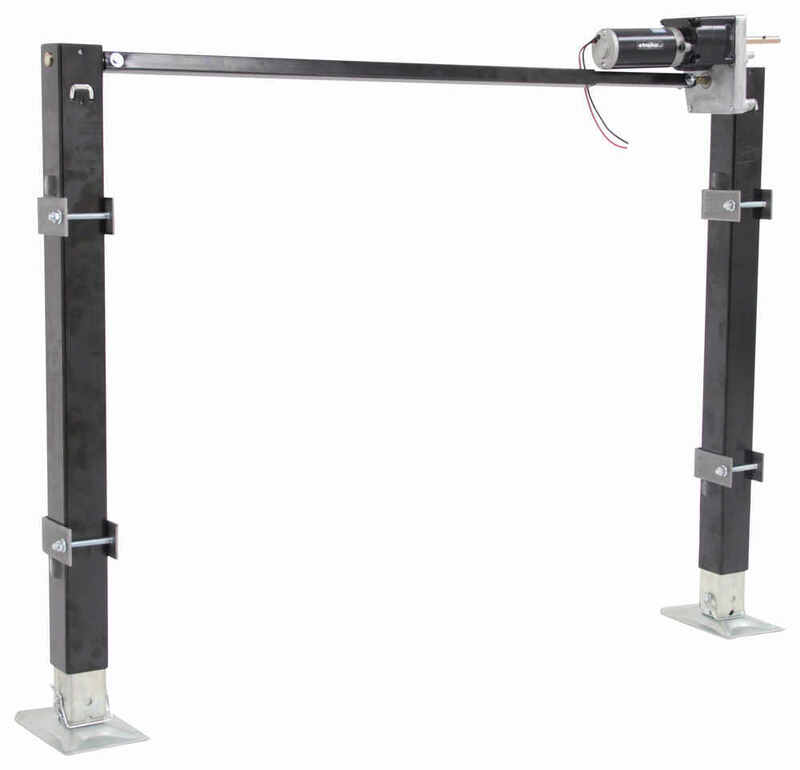 Guaranteed Lowest Price and Fastest Shipping for Stromberg Carlson Electric Landing Gear Set - Weld On - 34-7/8" Lift - 6,500 lbs. Camper Jack reviews from real customers. 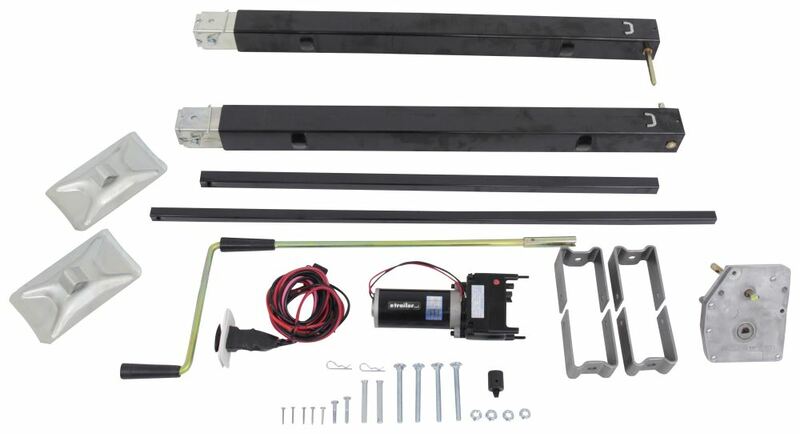 Support your 5th-wheel trailer or RV with this landing gear set. Oversize, self-leveling footpads provide superior stability. Crank sold separately. 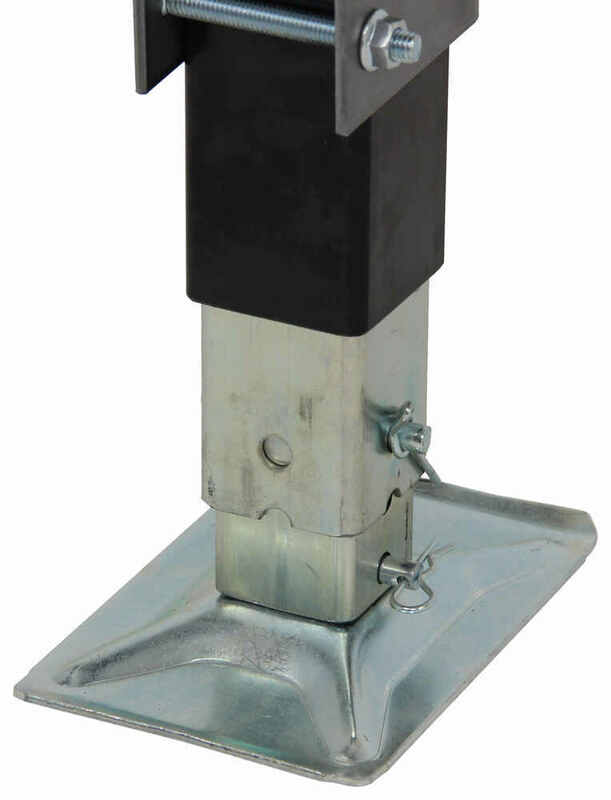 Replacement Lead Leg for Stromberg Carlson Landing Gear - 33-1/2"
Replacement Follow Leg for Stromberg Carlson Landing Gear - 33-1/2"
Today we're going to be taking a look at the Strombeg-Carlson Electric Landing Gear Set. This set is perfect for 5th-wheel campers. 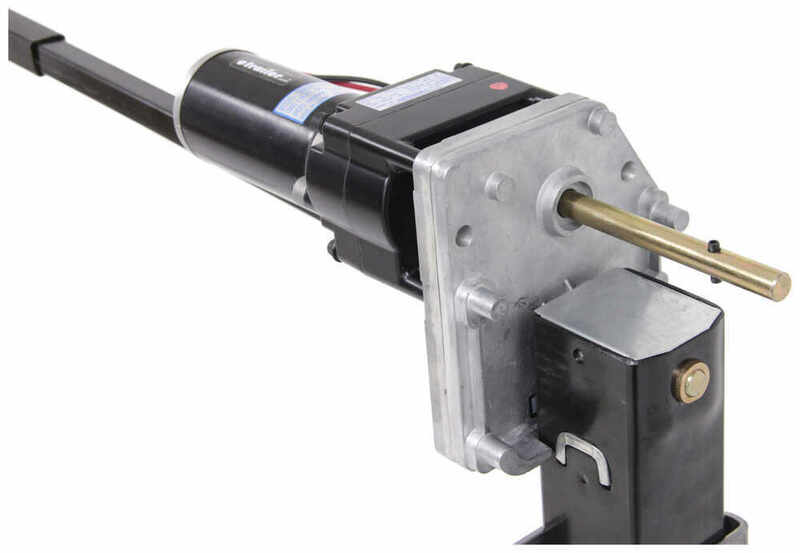 The electric-powered adjustment allows for nice, easy operation. It's going to feature the single-speed Lippert motor that has built-in safety features. The motor won't trip circuits or cause problems with the coach's electrical system, and it's IP-rated when it comes to the switch which is included. That means that it won't spark, so it can be mounted safely in the bottle-gas area of desired. Now each leg is going to come with a drop-leg, that's the insert located at the bottom that has the footplate attached to it. 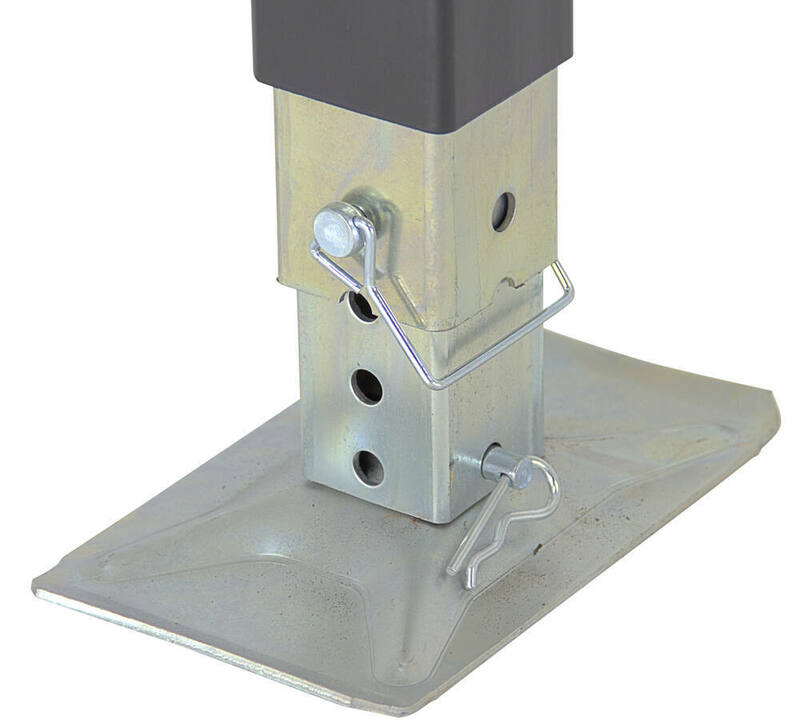 Drop-legs are designed to minimize jacking time, and it's going to help to level the trailer on uneven ground. Those legs are going to adjust in 1" increments, and the cage pins are included that allow you to easily release the drop-legs. Each leg comes with a removable footplate, that's going to be attached with another pin located at the bottom of the drop-leg. The footplate is really nice to have, that's going to help spread out the applied weight and prevent sinking on softer surfaces. Those footplates are a rectangular design. They're going to measure 5" wide by 8" long, and those can be removed and oriented the other direction too if you want. There's going to be a installation hole on each side of the inner tube there of the drop-leg to get that attached and installed in whatever orientation or position that you want. The unit's also going to come with a hand crank, this is going to allow for manual operation. The unit's made from a heavy-duty steel construction, it's going to feature protective finishes to keep the system safe from rust an corrosion. The gear box is housed in a corrosion-resistant aluminum body. 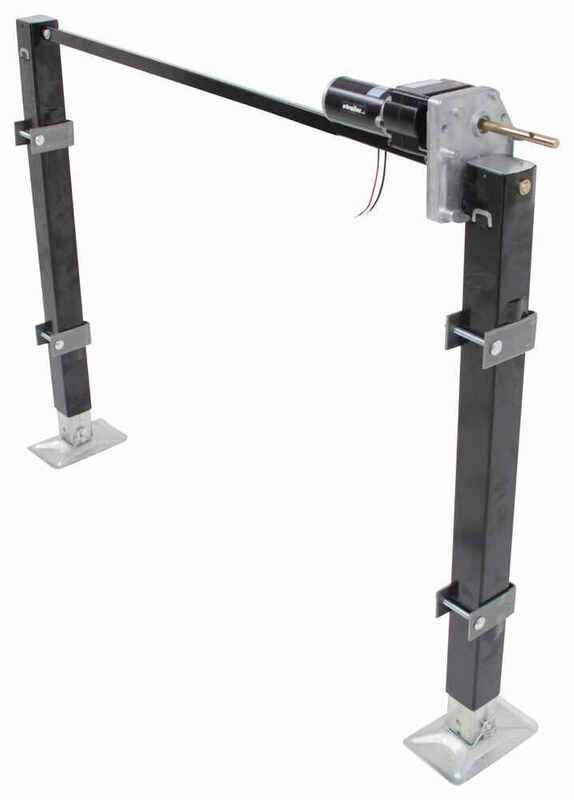 The landing gear is designed to weld on to the trailer frame with the included weld-on brackets. Now, I do want to point out that in order t make sure that your jacks are supported, whether they're being retracted or extended, so either way of operation, you want to make sure that one of your brackets is underneath one of the weld stops. Then you want to make sure that the other bracket is on top of a weld stop. The set's going to come with 2 jacks. You're going to get your gearbox and your motor. You're going to get your switch. Your going to get your footplates, cross shaft, hand crank. You're going to get your weld-on brackets, all the necessary hardware, and all your necessary wiring. A few measurements I want to go over with you real quick. First thing we're going to talk about is the weld stop distances. These are important because you want to know if this is going to be a perfect match for the trailer that you have. What we want to do are two different measurements. We want to take a measurement from the top of one weld stop, so not the actual bracket, but the weld stop. From the top of one weld stop to the bottom of the other, is going to be 19.5". From the bottom of this weld stop to the top of the other is 21.5". Again, from top to bottom 19.5", from bottom to top 21.5". The leg length is going to be 33.5", and that's the outer tube length so from the bottom of this portion right here, so just that outer tube that black portion, to the top of the jack is 33.5". Then from the bottom of the footplate to the top of the jack is going to measure 37.5". Now this system's going to use a stroke length of 19-7/8", which gives it a height of around 57-3/8" when fully extended. Then that drop-leg is going to give an additional 16" of travel that can be adjusted in increments of 1". The combined weight capacity for this unit is 6,500 lbs. The outer tubes are going to measure 2.5" by 2.5", and your cross shaft is adjustable from 41" to 71". 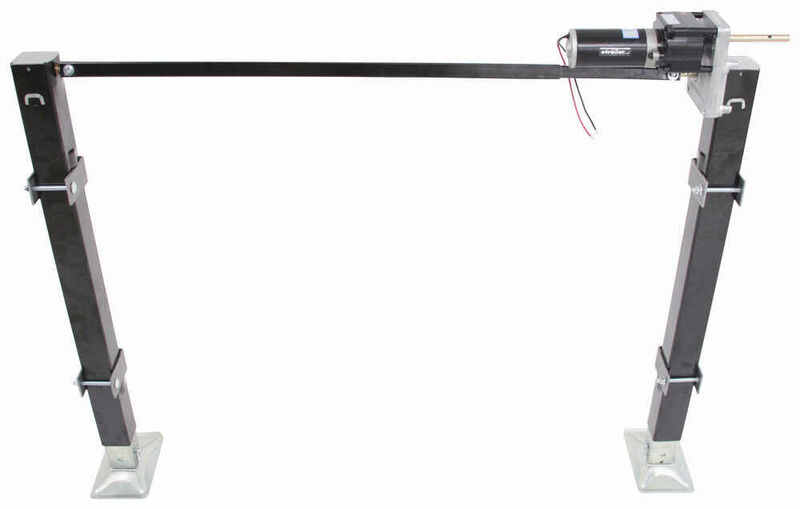 That's going to do it for today's look at the Strombeg-Carlson Electric Landing Gear Set. 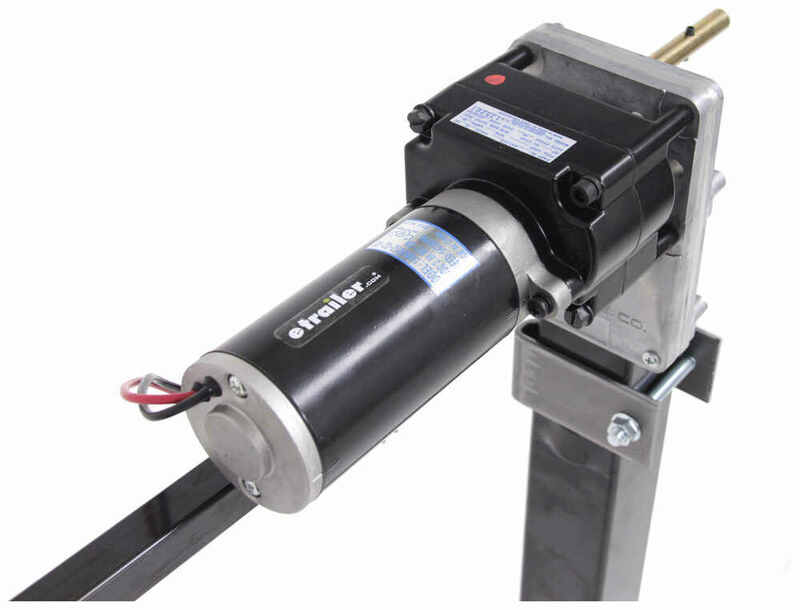 Order: RelevanceNewestRating - High to LowRating - Low to High Electric, fifth-wheel landing gear set's motor has an IP-rated switch for fast, easy, and safe operation. Each leg is 33-1/2" tall, offers 19-7/8" of travel, and has a 15" drop leg for extra lift. Combined weight capacity is 6.5K. We can get you un-stranded! The correct follow leg for your landing gear is going to depend on how long it is. If your leg measures 29-1/2" (see attached photo), you would need replacement # LG-179014, which can be used with most landing gear sets Atwood, Venture, and Lippert models. The same is true of replacement # LG-177201, which you would use if your leg measured 33-1/2". I've attached a link to a video review for you to take a look at as well. In case you want to just service your existing Venture VMC940 5th wheel landing gear driver leg you can use gearbox # LG-179015. For a complete replacement lead jack use Replacement Lead Jack with Drop Leg # LG-179013 which is a universal fit that works with major brands. I linked a diagram with measurements so you can compare to yours. 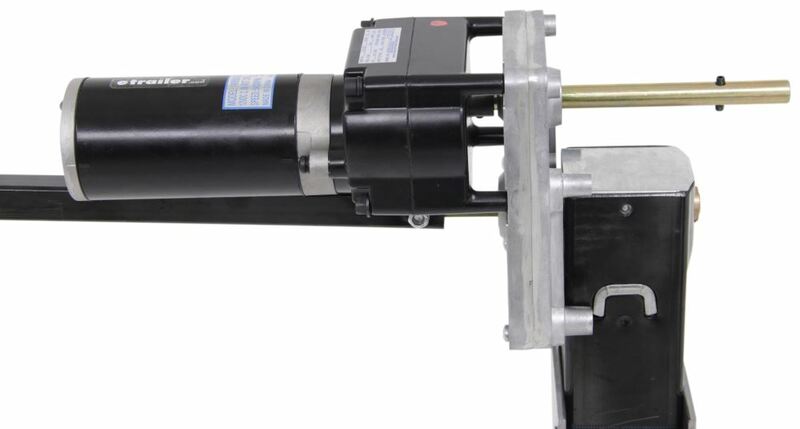 For a motor to convert the gearbox and leg to electric operation you can use part # LG-196308. How Do You Determine What Landing Gear Is On Your Trailer? 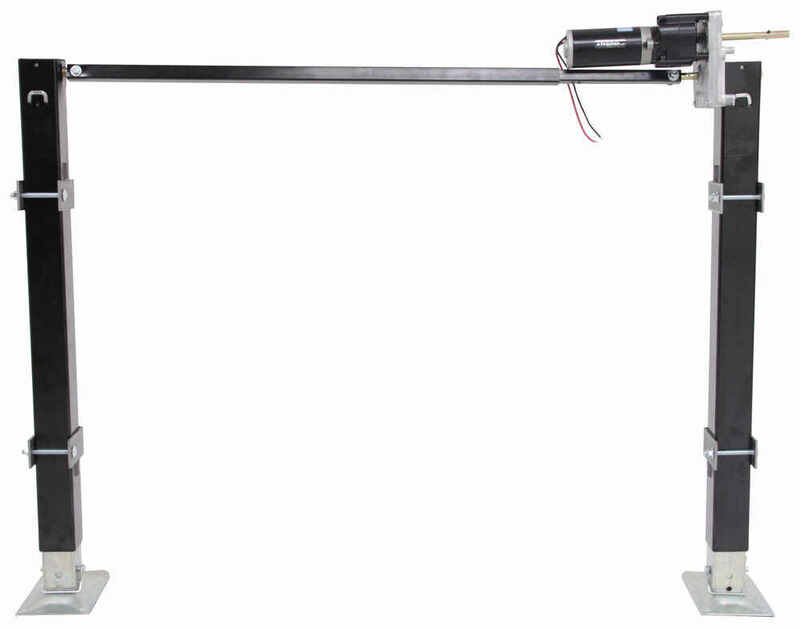 There is certainly landing gear which is going to work for you, though to get the correct one you'll need to measure the distance between the mounting brackets outside to outside. For example, the Lippert Electric Landing Gear Set # LC333964 measures 17-1/2" while the Stromberg Carlson Electric Landing Gear Set # LG-4 measures 19-1/2". I've added a link to our page with each of our available landing gear sets for you to take a look at. Sometimes the different color wiring won't match up. This is something that we see on vehicles all the time. If your landing gear, like part # LG-4, is doing the opposite of what you're telling it to do then you simply need to swap your wires. If you have a hyraulic landing gear set that lower on it's own you have a leak or a bad seal in your hydraulic lines. You'll need to have the system checked out and serviced most likely.